I’m very impressed with the plans for the restoration of Hay Castle, which are on display on the Festival site. I’ve been lucky to see inside the castle, as in the last two years the Festival has organised guided tours with experts. It’s a fascinating building, with so many quirks. If you’re around Hay this week, pop into the Groucho for a coffee/drink/meal, and you’ll see part of it. Today I confirmed a rumour that I’d heard about the bath. Prince Charles visited the castle a while back and commented on the fact that he collects baths. 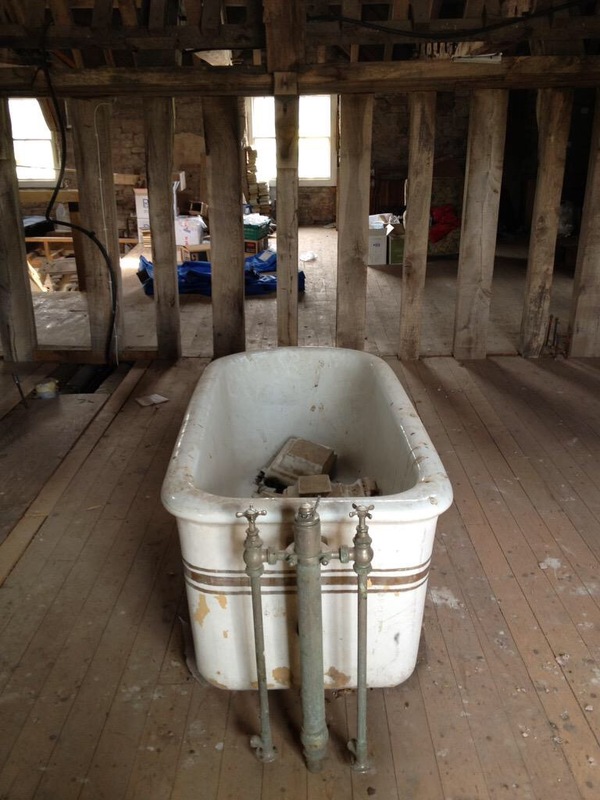 The Trust didn’t think that the tub fitted in with their plans, so it took 6 men one day to remove the bath from the castle. It now resides in Scotland. Colim Toibin provided much entertainment this morning in his own inimitable fashion, though one’s eyes were oft diverted by the very easy on the eye, Sarah Churchwell. Right now we find ourselves waiting in line for admission unto the presence of Jude Law, whilst Germaine Greer burbles from within. One of the pleasures of Hay is always the ability to watch and listen during downtime. Thus today we have been much entertained by the kind of conversations that would do justice to the scriptwriters of W1A or 2012. The pleasures of being nosey. Fascinating session with Professor Andrew Cull, who has documented 2000 years of madness – a term which has been used on and off for centuries, and has now been reclaimed by some of those suffering from mental illness. He illustrated the talk with a series of slides taken from his book, often disturbing in nature as he guided us through the various manifestations of the illness and it’s cures. What was surprising was that in the past, medical meanings existed in parallel to the superstious explanations of madness. His book also explores how novelists illustrated the subject, from Ibsen to Zola, including of course Charlotte Bronte’s Bertha Mason, the infamous ‘madwoman in the attic’. What’s clear (and for me, disappointing) is that the history of madness is not a linear one, with theories and treatments lurching back and forth over the years. Galina Timchenko, Mikhail Zygar, and Oliver Bullough talk to Nataliya Vasilyeva. The influence and impact of Russian authority is evident before the session even begins when we learn that Galina has had passport issues and joins the session via a live link from Moscow. Who is Putin? That’s the question everyone asked when he rose to power and to a great extent that is still the salient question. When Putin came to power and restored Russian control over Chechnya, he was genuinely popular but he was also ruthless in eliminating opposition; “opponents just vanished” said Bullough. Putin’s approval rating remains in the high 80% range, but Galina questions the way the polls are conducted and thinks that his real approval is “maybe half of the population”. Bullough reminds us that the opinions polls in the UK haven’t been too accurate of late. At the beginning of his presidency Putin wanted to join NATO and build alliances with Bush and Blair. He felt rebuffed by both. This was one of a number of blows that included the Orange Revolution in Ukraine that shaped a more hard line approach to Russian foreign policy. The annexation of Crimea was a piece of ruthless opportunism but it was exercised so efficiently that it had probably planned for some time. Mikhail Zygar runs an independent TV station that in January was effectively shut down by the authorities. The government banned advertising from non state channels in a direct challenge to the continued existence of the station. The viewers responded by raising $2m to keep the station on air. Greg Jenner, a historical consultant for the Horrible Histories, gave an entertaining presentation ‘A Million Years in a Day: A Curious History of Everyday Life’, charting the history of our everyday morning routine. From the question of how to dispose of the elimination of our body waste to the development of the toothbrush Greg delivered a précis of what the reader can expect to find in his new book. Photos of the ancient beds and pillows made me thankful for the million or so springs in my mattress and the desire of our Victorian ancestors for privacy means that I do not have to share my morning ablutions with the entire community. At one time, a shower or bath could prove fatal as the heater blew the poor unsuspecting victim into pieces. Arsenic seems to have fallen in and out of favour over the years and I am certain that the unhappy wife could have used this to her advantage whilst seeming to care for her husband’s skin, teeth, etc. Greg’s book charts the history relating to a day’s activities of the human being, including timekeeping, personal care, sourcing food, etc. Our sophisticated modern society has not necessarily progressed beyond that of the ancient civilizations. I wish that Greg had been around in my days of learning history when dates mattered more than understanding the sociology of the period. Colm Toibin, beckons. Thereafter, an edition of BBC3’s educational and entertaining series “The Essay”, and last but by no means least, and much to the delight and delectation of the lady of the party, the eponymous Jude Law, the man earmarked to play me in the inevitable forthcoming biopic. Indulge me in my dreams. Pip pip and anon.